This new release is actually a reissue of an older book. It’s a great one, too. Rick Wakeman is arguably one of the most talented musicians out there in the rock music world. He’s been incredibly prolific as a solo artist, with bands like Yes and The Strawbs and in session work with Elton John, Black Sabbath, David Bowie and a lot more. In terms of the Elton John reference, Sir Elton actually does the foreword to this book. While this is dated, it’s also limited in scope to a historic period. That means it really doesn’t matter. The 1970s are a set period in time and unchanging. So, the book doesn’t require updating. 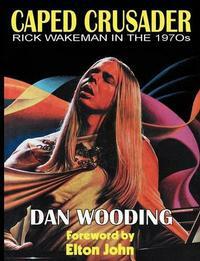 This book showcases Wakeman the person and Wakeman the artist. Rick Wakeman is a man who doesn’t seem to recognize a lot of limitations. He’s also a man who doesn’t take himself too seriously. He’s got a great sense of humor and it shows here. Told through narration, anecdotes and more, this is an intriguing tale. It comes with some great pictures and is highly recommended to all fans of Wakeman. Further than that, though, it’s recommended to anyone who wants to read about a real musician in a book that’s an entertaining reading experience. In an age where image is often more important than talent in the music business, it’s refreshing to read about an artist who in some ways has both.